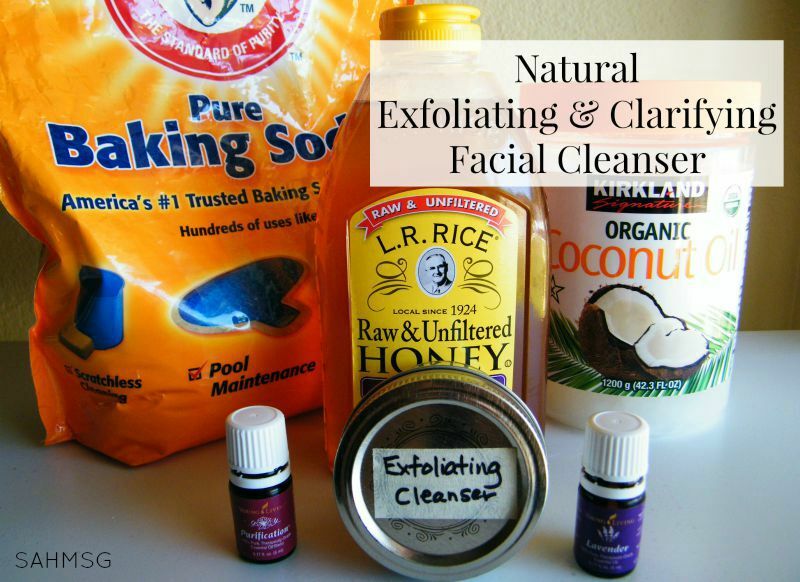 This facial cleanser is easy to prepare, super cheap, and does triple duty by not only cleansing but acting like a mask and moisturizing. 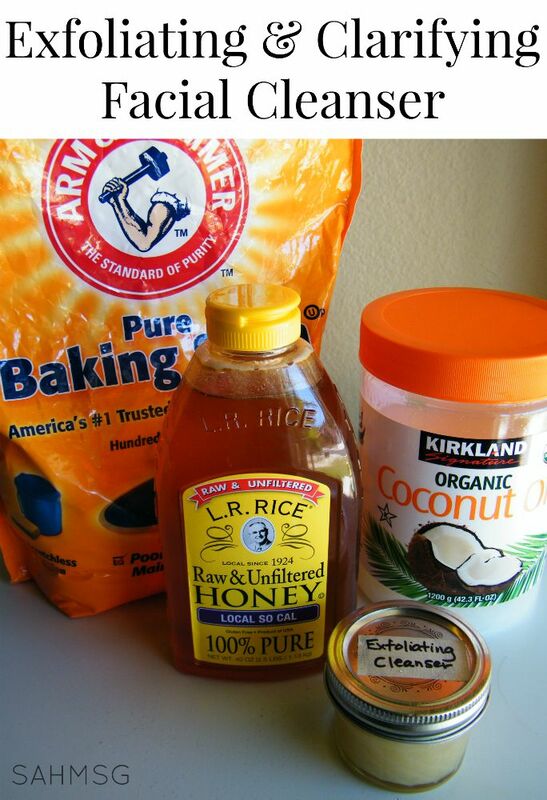 It is natural, great for the skin, and takes about 5 minutes to mix together. My skin needs some work. After having my second child, the texture and clarity of the skin on my face went south. After a time, I just resigned myself to living with it. Lately, I have found some tricks for helping to support my skins natural healing-huge since the issues with my skin started over 4 years ago! 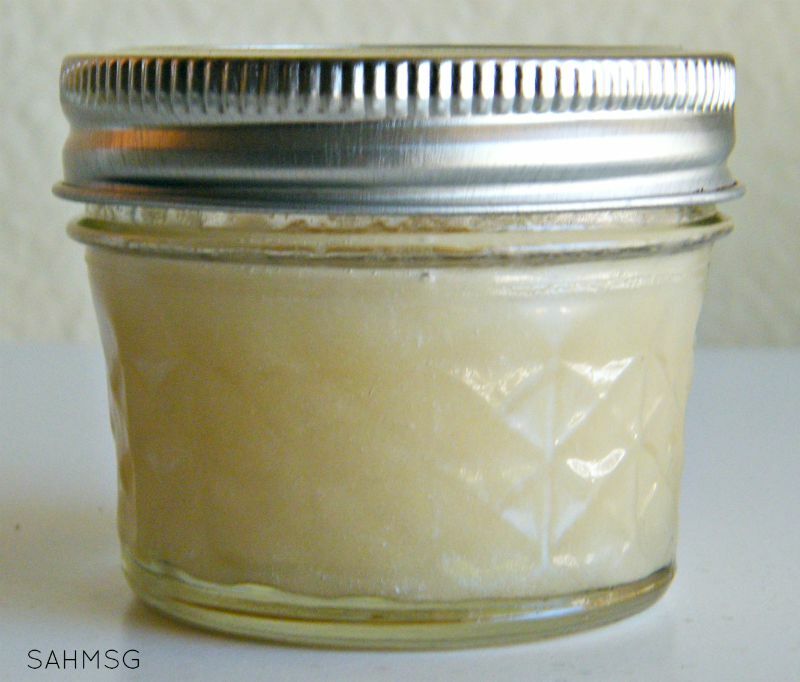 This exfoliating cleanser is a simple way to promote healthy skin. You can use only 3 ingredients, but I have a handy 4th ingredient that really makes this a power mixture. I use this clarifying and exfoliating cleanser to help reduce the size of my pores and eliminate black heads and blemishes. It has been leaving my skin more refreshed, and it is an easy way to use essential oils in my skin care routine. They have been such an asset for supporting my skin. Step 1: Measure the honey, baking soda and coconut oil and pour all into a bowl. Step 2: [optional] Add 24 (or so) drops of your favorite essential oil(s). 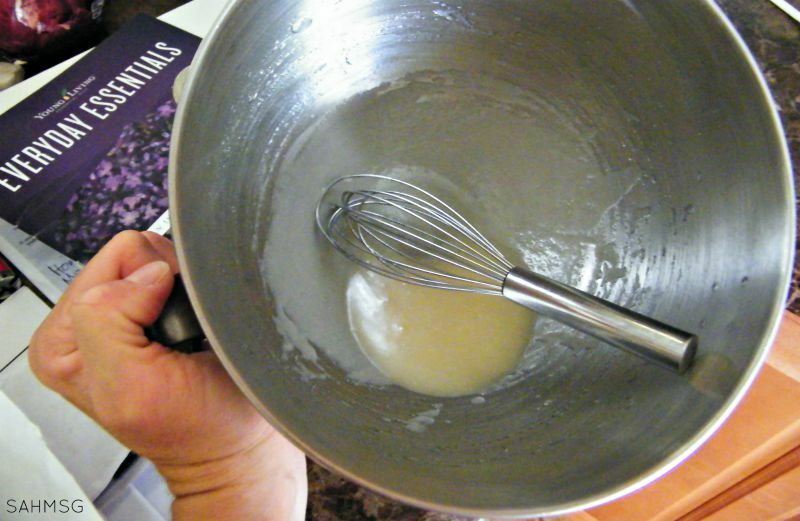 I used Purification once, Lavender once and Thieves once when making this facial cleanser. Joy is great in moisturizers too, so adding it to this facial cleansing mask would smell great! Frankincense, Sacred Frankincense, Elemi or Tea Tree oils would be great as well. Choose your favorite! The citrus oils are great for skin, but can cause light sensitivity. If I use citrus oils in this cleanser, I just use it at night so there will be at least 12 hours before I am back in the sun. Considering the benefits of essential oils even when applied topically, it is such a great place to add them into your daily routine. Step 4: Pour the mixture into your jar, and close the lid tightly. I added a little label made from masking tape (not too fancy) so I would be sure to know it was the cleanser and not my moisturizer. Using essential oils on my face in particular has been a new addition to my skin care routing in the morning and at night. When oils are applied topically, it takes them about 2-3 minutes to reach the bloodstream, so leave this cleanser on as a mask for a couple of minutes to gain the full benefit to your overall wellness. Of course just the promotion of healthy skin is a great benefit all on its own. This article is a great summary of all that you can do with honey. Honey has powerful health benefits. Such an inexpensive and versatile product, it is a great addition to skin care and overall wellness. I have noticed the texture of my skin has improved and my pores are clearer. Honey is an amazing item to keep in your pantry-and bathroom in this case. 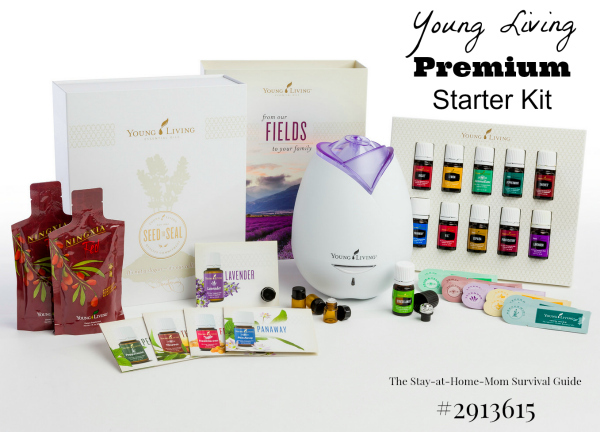 If you are interested in incorporating essential oils into your daily wellness routine, I can help you with that! 🙂 More information can be found on my Essential Oils page, along with simple instructions for how to sign up so you can start using oils. This is so cool. I was just going to look into a moisturizer. I’ll make my own now. Thank you. Honey is a natural antibacterial. My 4 oz jar lasts a few months without an issue. It may vary depending on the temperature of your home. Quick question. It looks like you’re using the solid coconut oil. Will that be hard to use? Do you liquefy it first? You can liquefy in a double boiler if necessary. Otherwise, you can use fractionated coconut oil that is liquid at room temperature. I’m having a hard time with the measures. Are those teaspoons or tablespoons? It’s a tablespoon of baking soda and a teaspoon of coconut oil or other carrier oil. So this is used daily, once in the morning and before bed? You can use it daily once or twice a day. I have done both and had great results. You can alternate it with a foaming facial cleanser where you use one in the morning and one at night. Just be sure to use citrus oils at night so you can avoid the UV rays when you have citrus oils on your skin. Tried it yesterday and I feel a difference in my face after the first time. Love it. Thank you so much. But when I opened the jar today it is raised a bit. Should I keep the jar in the fridge or is this normal?? That happens to mine too. I just mix with my finger before applying. I love this cleaner so much! I am glad you like it. I love this recipe; I already use these ingredients on my face, but I don’t have them ready-mixed. It is time consuming to put them together every time I wash my face so this is great! And it would be even greater if I could just pump it out instead of opening a jar and sticking my fingers in. It does stay liquid, so you could try it in a pump, but only using it twice a day, I did not find opening and closing the jar to be a huge hassle. The benefits of natural products are worth it. Thanks for the kind words! I appreciate you sharing. What a luxurious yet simple recipe! Can’t wait to try this!